Pictures show the vehicle's interiors completely damaged. In a match between a bear and a car, it was the former that won the bout - and a post shared on Facebook shows the shocking outcome of this contest. 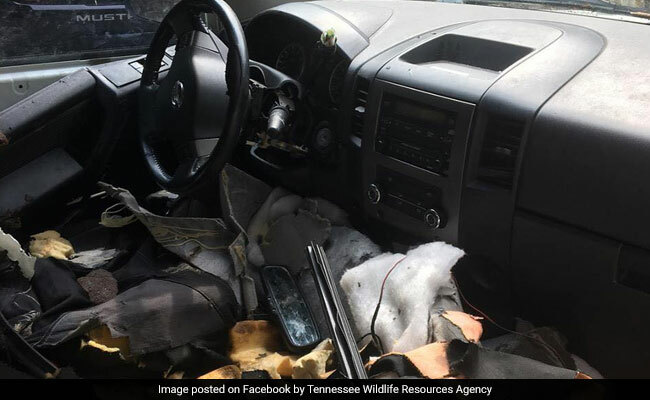 Pictures posted by the Tennessee Wildlife Resources Agency show the sorry state of a car after a bear entered it and got trapped inside it. The agency is now warning people to make sure they keep their cars locked. "Lock your vehicle doors when in the Smokies and never leave food inside!" says the post shared along with the pictures. According to the post, a black bear had managed to get inside the unlocked car and got trapped inside. The post warns people not only to keep their cars locked but also not leave any food inside. "Thieves are least of your worries with hungry bears roaming around!" says the post. Since being shared on September 7, the post has collected over 5,500 shares and more than 2,300 rections. "My goodness, the bear tore up the inside of that truck!" says one Facebook user. "Wonder if insurance pays for that," says another. "That bear was probably terrified and very hot too once it found itself locked in," says a third. Back in January, a group also vacationing in Gatlinburg, Tennessee, found a hungry bear locked inside one of their cars, which happened to have some dog treats inside it. A video shows people trying to get the bear out of the car but not before it completely destroyed the vehicle's interiors.